Are you looking for a bold red car that you know will be noticed on the road? Are you looking for a sunny yellow car that will make you happy when you see it? Are you an understated kind of person who would like to drive a black car? 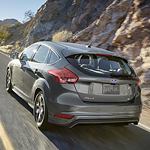 When you buy a Focus, you have the option to choose one in a color that you love. Are you someone who likes to stick with the wheels that come standard on your vehicle? If so, you will appreciate those on the Ford Focus. If you are someone who likes to change things up, there are options for you to do that.